The belligerent title “the war on antidepressants” is interesting in itself, because it was borrowed from a piece recently published by Jauhar and Hayes,1 two UK-based psychiatrists. It illustrates well that the controversy surrounding the use of antidepressants has now turned into a heated dispute. This is a sad and very unfortunate state of affairs because by fighting we have never really solved the problem. This article will retell why two psychiatrists might declare that there is a war on psychiatry’s best-selling drug, what this has to do with antidepressant withdrawal and how a debate unfolded into a “war”. Because this issue has become political and contentious, I will start by honestly revealing that I also eventually entered this dispute by responding to a fierce critique from Jauhar and Hayes. Although some may allege I am biased for taking sides, my clear aim here, as it was before, is to stick to the scientific evidence. So let us start from the beginning. The media largely failed to notice this dispute until Davies and Read published a systematic review on antidepressant withdrawal on 4 September 2018 in the scientific journal Addictive Behaviors.4 This review estimated that, based on clinical trials, naturalistic studies and patient surveys, around half of antidepressant users experience withdrawal reactions, and that, exclusively based on patient surveys (the other study designs did not assess severity), just under half of the people concerned describe their withdrawal as severe. They also reported that, according to several studies, the mean duration of withdrawal reactions was much longer than merely two weeks. These findings stand in stark contrast to the information given in official treatment guidelines, which all corroborate the claim made by Burn and Baldwin (minor symptoms that resolve within 2 weeks in the vast majority). 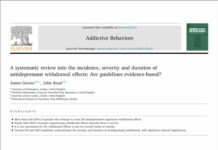 Thus, the alarming findings of the Davies and Read review understandably attracted much media attention and many newspapers were concerned about the massive numbers of people apparently suffering severe and protracted withdrawal effects (see for instance this report in The Guardian5). Given that the biomedical treatment approach constitutes the foundation of modern psychiatry, it was not further surprising that challenging the long-term safety of antidepressants caused discomfort (and, in my view, also disbelief and even denial) within academic psychiatry. I will return to this issue later. But for now, this was the moment when the psychiatrists Doctors Hayes and Jauhar entered the scene. In a blog post for the Mental Elf dated 18 October 2018, they made serious charges against Davies and Read, criticising their work as severely flawed. According to Hayes and Jauhar, the selection of studies was biased, the data extraction and analysis was biased, and both the presentation and interpretation of results were biased.6 Their blog concluded that “the non-systematic way in which the review is written, with errors in data extraction and interpretation, make it difficult to accept the findings with any confidence”. On 5 November 2018, Davies and Read responded comprehensively to the Mental Elf critique on the website of the Council for Evidence-Based Psychiatry.7 I will discuss the most important issues below, as they were later re-addressed in even more detail in a journal publication. On 23 January 2019, Jauhar and Hayes eventually published their extensive critique of the Davies and Read review from the Mental Elf blog as a research paper in Addictive Behaviors. Their paper was entitled “The war on antidepressants: What we can, and can’t conclude, from the systematic review of antidepressant withdrawal effects by Davies and Read”. But why is it that a scientific debate became a war? In my view, and based on emotionally charged exchanges between Read, Jauhar and Hayes on Twitter, it appears that the psychiatrists (Jauhar and Hayes) perceived the withdrawal review as an attack from psychologists (Davies and Read) on the field of psychiatry. The Twitter controversy was carried on in an increasingly aggressive tone with ad hominem attacks and criticism aimed at entire professional groups (admittedly, from both sides). Unfortunately, there appears to be a lot of tension and disagreement between psychology and psychiatry when it comes to the risk-benefit ratio of antidepressants. What started as a scientific dispute was, as I perceive it, blown up to a clash between mental health professions. While on one side (mostly psychologists) there was a desire to speak out about an underestimated risk of antidepressant use, the other side (mostly psychiatrists) tried to dispel these fears by contending that the withdrawal review was systematically flawed, its authors biased, and the occurrence of withdrawal massively overestimated. Sometimes, rather odd arguments were put forward in defence of antidepressants. For instance, one common reply to safety concerns repeatedly expressed on Twitter reads: “This is pill-shaming, the drugs have helped many patients”. The aim of other comments appears to be solely motivated by the desire to insult. For instance, on 25 January 2019, Hayes wrote on Twitter that the work by Davies and Read was a “wrong’un” and a “pig’s ear”. What I wanted to illustrate is that the critique by Jauhar and Hayes expressed on social media and in the scientific literature was exceptionally fierce and reproachful. In my view, their critique was not only offending, but I also think that some of the most serious charges were unsubstantiated. Therefore, at this point, I felt that I have to enter this debate,8 because some (not all) allegations put forward by Jauhar and Hayes were evidently false. Davies and Read convincingly debunk most of them in their comprehensive response.9 For instance, contrary to what Jauhar and Hayes imply, the review set out with a comprehensive and systematic literature search. Inclusion and exclusion of studies was transparent and comprehensible. Moreover, the allegation that both the presentation of the results and the conclusions drawn from the data are severely flawed is unwarranted (or at least grossly exaggerated). So does the Davies and Read review have no limitations at all? No, of course it has, as all research has. A major limitation is that the review is based on many studies that themselves have limitations. For example, most clinical trials were of very short duration, often merely a few weeks, and therefore possibly misleading, since most patients use antidepressants for at least one year (withdrawal reactions are unlikely when the drug was used for a very short time only). On the other hand, the generalizability of attitude surveys is limited due to selection bias (people with a specific interest in the topic are more likely to participate). However, this certainly is no failure on the part of Davies and Read and they also acknowledge these limitations in their review. Still, to be honest, I do not completely disagree with all issues raised by Jauhar and Hayes.1 For instance, I agree with them that the quality of the individual studies included in the review could have been assessed more systematically with a formal risk of bias measure. I also agree that the meta-analytic procedure applied by Davies and Read was rather crude (e.g. they did not address heterogeneity and they did not compute confidence intervals to quantify the precision of the point estimates). Nevertheless, and apart from these issues, the review was generally conducted in a systematic, transparent and objective way, so I would say that its methodology was mostly sound (and not severely flawed, as contended by Jauhar and Hayes). 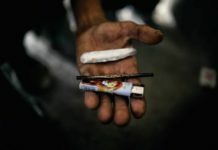 Most importantly, I don’t think that the limitations detailed above invalidate the main study findings and the conclusion drawn from the data, namely that withdrawal effects are much more common and persistent than indicated in official treatment guidelines and that a substantial portion of patients consider their withdrawal severe. But that’s just half of the story. In my view, Jauhar and Hayes made several false and discrediting allegations.8 For instance, as comprehensively discussed by Davies and Read,9 Jauhar and Hayes contend that the review negligently missed 5 randomised trials, but upon closer inspection, Davies and Read noted that none of these industry-sponsored trials actually reported the incidence of withdrawal effects and that Jauhar and Hayes obviously did not check these publications. Instead, they apparently relied on a review co-written by the study sponsor (the pharmaceutical company Lundbeck), quoting figures that are not reported in these industry trials. In addition, Jauhar and Hayes write in their critique1 that “[Davies and Read] seem also to misunderstand simple principles that underpin why blinded RCTs are necessary. Thus, in the trial by Montgomery et al. (2005), DESS score was higher during placebo treatment than active treatment. … The findings from the Montgomery study illustrate precisely what a nocebo effect is.” This statement is absolutely false and misleading.8 The trial by Montgomery and colleagues was a so-called ‘discontinuation trial’. In this type of study, participants are treated with an antidepressant for a few weeks until their symptoms improve (in this case, 12 weeks), and then, in a randomly selected group of participants, the drug is unknowingly discontinued and replaced by a placebo pill, whereas the other participants, also unknowingly, remain on the drug. As a result, participants in the placebo group may experience withdrawal effects (as assessed with a questionnaire called DESS), whereas those who stayed on the drug, of course, cannot experience withdrawal. This explains why the DESS score is higher in the placebo group than in the drug group. Thus, this trial provides compelling evidence of a withdrawal reaction following discontinuation of an antidepressant. This is certainly not a nocebo effect. To be clear, this is not some kind of an academic quibble where some researchers disagree on an equivocal issue, but unambiguously a false allegation and serious misinterpretation of the data on the part of Jauhar and Hayes. It’s very unfortunate that such a fundamental error found its way into a scientific publication that will probably be read and disseminated widely. Understandably, such key opinion leaders (i.e. prominent speakers for the pharmaceutical industry) will certainly not write something that may offend the pharmaceutical industry. After all, you don’t bite the hand that feeds you (this bias is scientifically well established11). Instead, they state in their review, just like Burn and Baldwin did in their letter to The Times, that antidepressant withdrawal typically resolves spontaneously over 2–3 weeks. However, they just offer three references in support of this spurious claim.10 Two of these three references were case reports, both published in 1995, including 1 and 3 patients for a total of 4 patients (withdrawal lasted 3 weeks in one report and between 3 and 23 weeks in the other). The third reference, the only cohort study cited in support of their 2-3 weeks claim, was a small study by Fava and colleagues from 2007.12 In this study of 20 patients, a withdrawal reaction was observed in 9 patients (45% of all patients examined) and the syndrome subsided within 4 weeks in 6 patients (67% of all patients with withdrawal), whereas in 3 patients (33% of all patients with withdrawal) serious withdrawal symptoms persisted for several months after discontinuation. Two things are noteworthy about this review published in the American Journal of Psychiatry: Not only did the authors arbitrarily select only three studies reporting on the duration of withdrawal based on a total of just 24 patients (which is by no means representative of the broader patient population), the evidence they cite does not even support their spurious claim. Two references were merely case reports, which have very little external validity, and the small cohort study they quoted found that in two-thirds of patients withdrawal lasted up to 4 weeks and in one-third, it lasted several months. So, once again, a prominent claim that withdrawal effects resolve within 2-3 weeks in the vast majority of patients misrepresents the scientific evidence and, therefore, is empirically unsubstantiated. 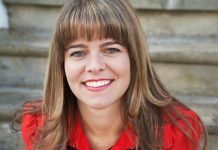 Ironically, when researchers present selected case reports of patients who experienced severe and persistent withdrawal lasting for several months, then academic psychiatry swiftly points out that this is merely anecdotal evidence of poor external validity and therefore inconclusive and misleading. However, eminent US psychiatrists come through with just that in a leading psychiatric journal as long as the message that these anecdotal reports carry are welcome. This is alarming and unscientific. Thus, given that Jauhar and Hayes pretended to be concerned about scientific integrity, one would expect that they immediately wrote a fierce critique rightly challenging Rush and Trivedi for misrepresenting the scientific literature and for drawing misleading conclusions about the duration of withdrawal effects. But obviously they did not and they probably never will. 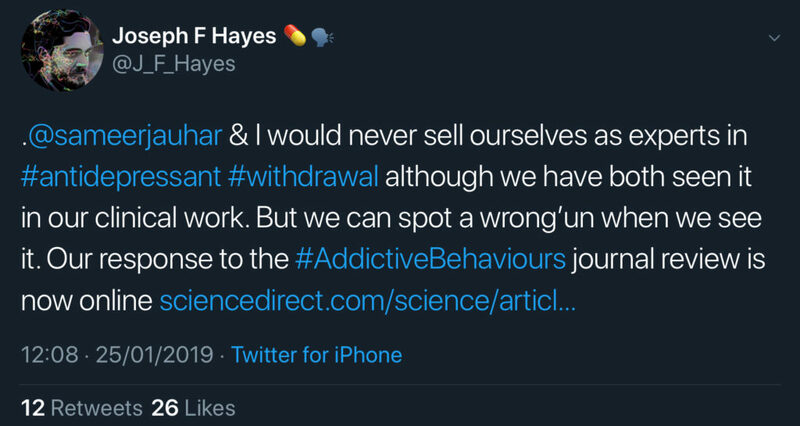 The “withdrawal typically resolves within 2 weeks” claim, although scientifically never firmly established (one might even say, it was disconfirmed), is rigidly defended by academic psychiatry and its strong ally, the pharmaceutical industry. To admit that antidepressants may cause physical dependence and thus severe withdrawal reactions in a significant portion of especially long-term users, would challenge the current practice to prescribe these drugs to evermore people for increasingly longer duration for even mild forms of depression and anxiety. The victims of this excessive prescribing also referred to as overmedicalization, are the millions of patients worldwide who suffer from withdrawal reactions and who discover that they cannot come off their antidepressants.13 Davies and Read put the claim that withdrawal symptoms affect only a small minority and typically resolve within 2 weeks to the test. They provide evidence that withdrawal effects occur in about half of all antidepressant users and that withdrawal is experienced as severe in about half of those concerned.4 These findings clearly contradict the preferred narrative in mainstream psychiatry. The media widely disseminated these inconvenient findings and soon the review by Davies and Read was fiercely attacked by academic psychiatry in the person of Jauhar and Hayes, who contend that the review was flawed and systematically biased.1 However, most allegations did not stand up to scrutiny and turned out to be greatly exaggerated or even false.9 In the interest of the patients who are currently experiencing withdrawal reactions and the many more who will suffer withdrawal effects in the future, we need to end this “war”. Academic psychiatry must address these problems and conduct thorough research on withdrawal reactions. Instead of declaring war, psychiatry should offer solutions on how it wants to combat severe and persistent antidepressant withdrawal. And it is important that psychiatry and clinical psychology reconcile, because, ultimately, we are on the same mission. Our purpose is to help people with mental health problems. Let’s not forget this, even amidst fierce scientific debates. 8. Hengartner MP (2019). Commentary on Jauhar and Hayes. Addictive Behaviors, in press. 10. Jha MK, Rush AJ, & Trivedi MH (2018). When discontinuing SSRI antidepressants is a challenge: Management tips. American Journal of Psychiatry, 175:1176-1184. 11. Wang AT, McCoy CP, Murad MH, & Montori VM (2010). Association between industry affiliation and position on cardiovascular risk with rosiglitazone: Cross sectional systematic review. British Medical Journal, 340:c1344. 12. Fava GA, Bernardi M, Tomba E, & Rafanelli C (2007). Effects of gradual discontinuation of selective serotonin reuptake inhibitors in panic disorder with agoraphobia. International Journal of Neuropsychopharmacology, 10:835-838. 13. Hengartner MP, & Plöderl M (2018). False beliefs in academic psychiatry: The case of antidepressant drugs. Ethical Human Psychology and Psychiatry, 20:6-16.